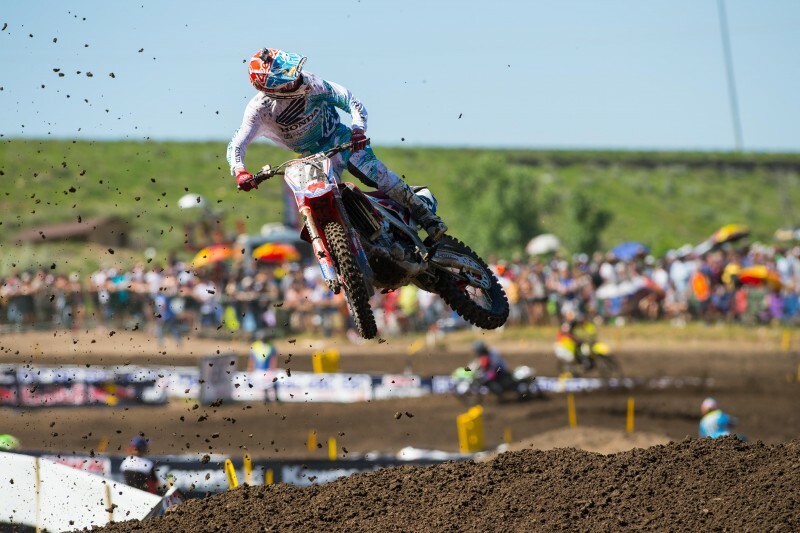 Team Honda HRC had an positive showing at the third round of the AMA Pro Motocross championship in Lakewood, Colorado, as Cole Seely finished fourth overall for the day with 6-3 marks, while teammate Trey Canard landed fifth with 3-6 finishes. In the day’s opening moto, Canard propelled his CRF450R to a sixth-place start and quickly moved into fourth on the opening lap. He maintained that position for the first half of the race but began closing the gap on third, ultimately making his move on lap 10 to take over the final podium position. 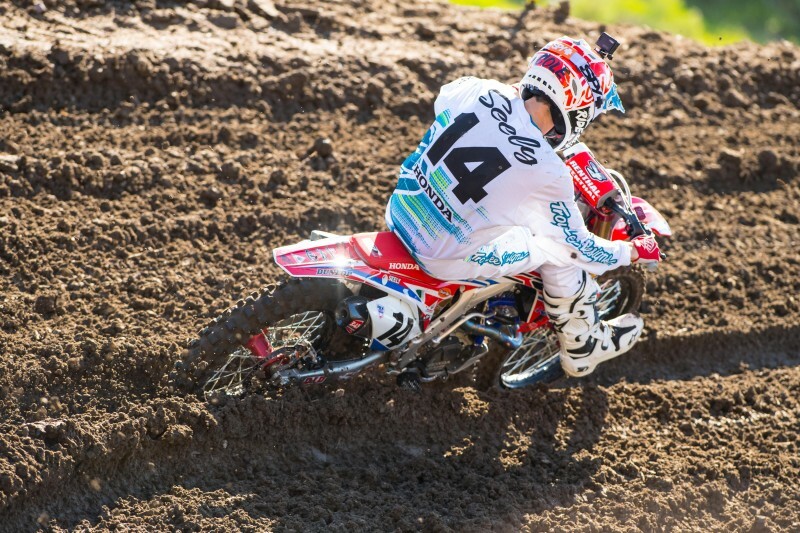 Seely tangled with another rider off the start, shuffling him back to nearly 20th, but he put together an impressive charge, laying down smooth and consistent laps throughout the 30-minutes-plus-two-lap race. With six laps remaining, Seely briefly made the pass on fifth but was unable to make it stick, taking the checkered in sixth. 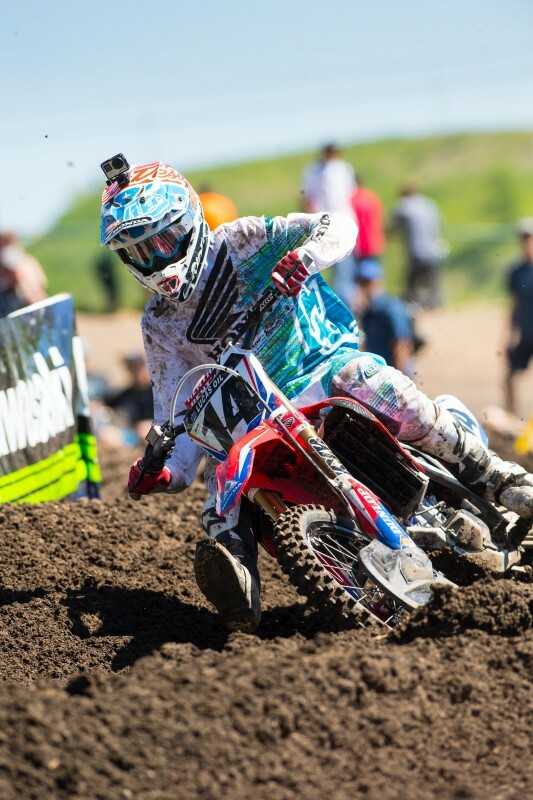 In moto two, Canard grabbed the holeshot, with Seely in his draft. 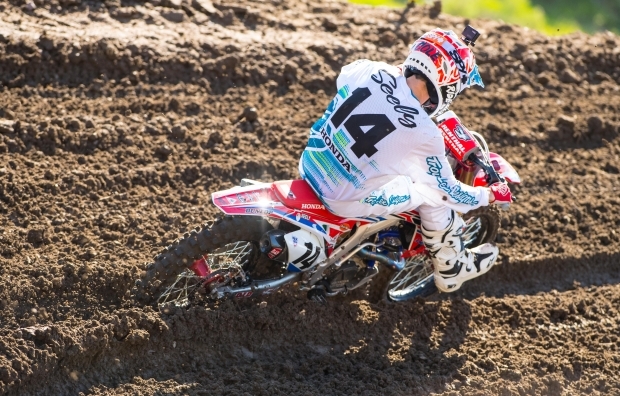 A heated battle ensued between the Red Riders, with Seely taking over the lead on the second lap. He relinquished one position on the following lap and another at the halfway point before hanging tough in third, scoring the best moto finish of his career. 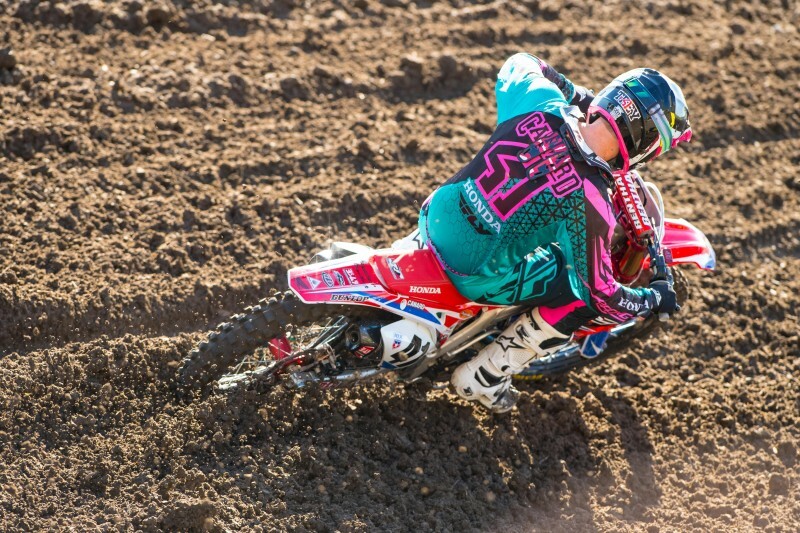 Meanwhile, Canard fought hard to maintain an overall podium position but was unsuccessful after slipping back to sixth by the checkered flag. 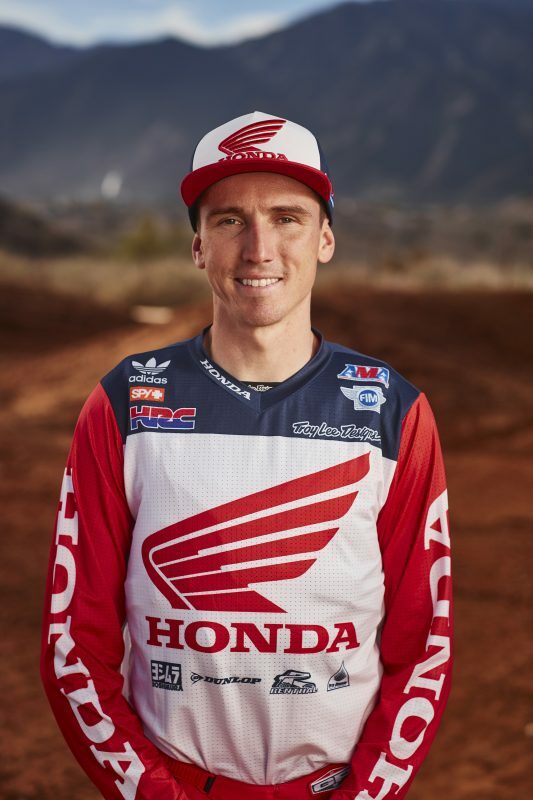 On the eve of the race, Team Honda HRC’s Trey Canard and Cole Seely, along with GEICO Honda’s Justin Bogle, RJ Hampshire and Jordan Smith, attended Sun Enterprise’s annual fan fest, one of the largest autograph signings of the year. Hundreds of racing enthusiasts were on hand to meet the riders and take part in the festival-style event. Only a mere .485 seconds off the leader in qualifying, Canard scored the second-quickest time with a 2:08.313 mark posted in the second session. 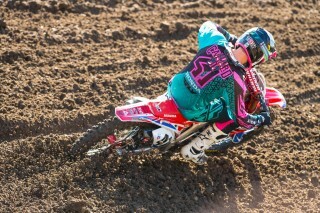 Seely followed in eighth with a 2:09.384. After three rounds, Canard currently sits fifth in the championship standings with 97 points, while Seely is sixth with 89. 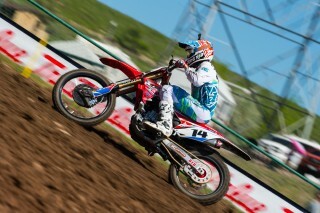 Bogle is 11th with 47 points. 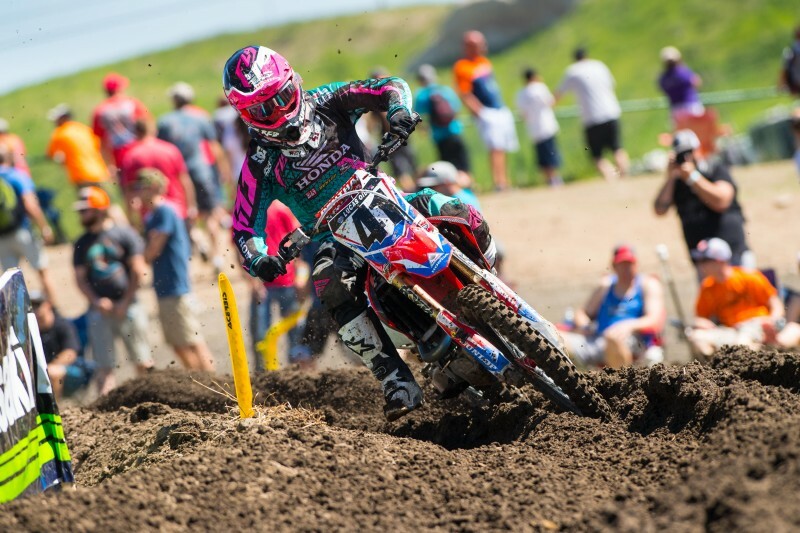 Team Honda HRC will take a one-week hiatus before returning to action on June 18 for round four at High Point Raceway in Mount Morris, Pennsylvania. With an hour between the checkered flag in moto one and the gate-drop for moto two, riders and crewmembers have very little time to regroup and get prepared for the day’s second race. For riders it means regrouping both physically and mentally, while their mechanics have to prepare their equipment for another 30-minute-plus-two-lap race. Today went really well. 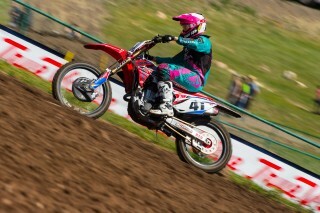 It felt good to finally get on the podium in the 450 class during motocross. 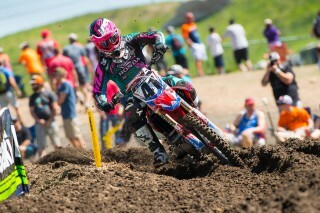 I think I started outside the top 20 in the first moto, but I was able to fight my way up to sixth. 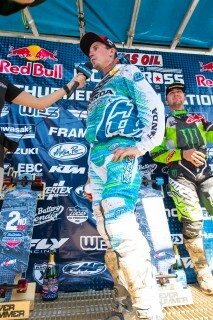 I was fifth at one point but Eli [Tomac] got around me with two laps to go, so I settled for that. The first couple laps of the second moto were actually really fun. Both Trey and I started up front and had a good battle going. 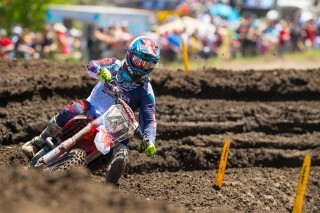 I got by him, taking over the lead for a little bit but Kenny [Roczen] and Eli got by me. Towards the end, I knew Dungey was coming; I could see him behind me out of the corner of my eye, so the last few laps of the race, I just put my head down and tried as hard as I could to maintain third. In the end it paid off. I feel like things are starting to click and I’m only going to continue to get stronger. I’m really disappointed with how today ended. I should’ve been on the podium but couldn’t put it all together. There are positives to take away, but it’s still extremely frustrating because I had a good first moto and was running up front in the second. I’m continuing to get good starts, which is good, so hopefully that can continue and I’ll be able to start fighting up front with the leaders. 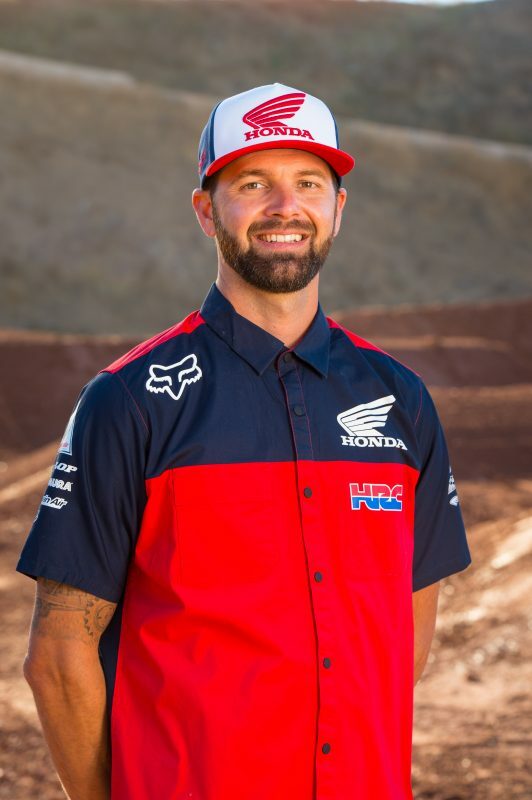 The entire Team Honda HRC crew is working really hard and I’m happy with the bike, so I just need to regroup during the off weekend and come to High Point swinging. It was a great day for the whole team I think. 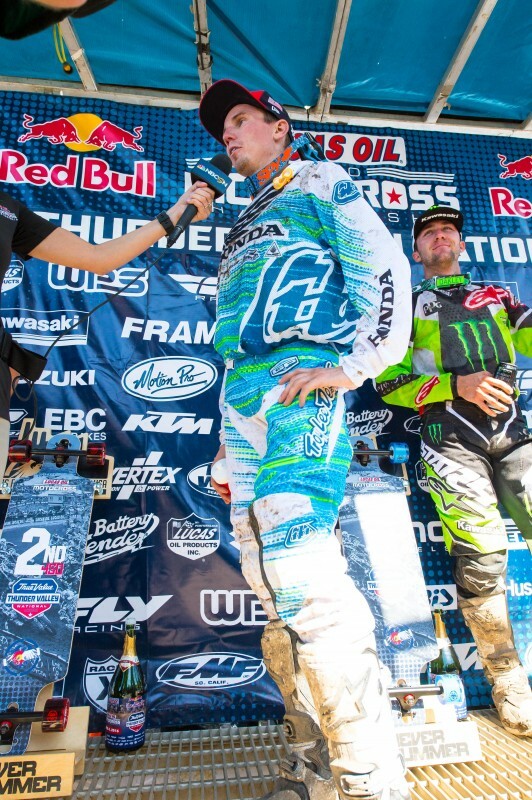 Having a guy on the podium both motos is a good step in the right direction and then starting 1-2 was awesome. Cole rode well today. He actually really surprised and impressed me at the end of the second moto because his lap times fell off a little bit, so I thought [Ryan] Dungey was going to catch him, but he dug deep, dropped his times back down and hung onto third. After first practice, we gave all the guys a more aggressive map to help make up for the lack of power at elevation, and as far as suspension goes we started Cole with the same setting we left Glen Helen with. Again, we softened it up for him going into the second moto, which helped when he started to get tired. I think the whole team is getting better and making progress each week.